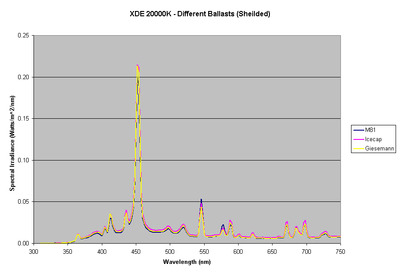 In an earlier article, I presented the spectral analysis of five 150W Double Ended (DE) lamps along with 4 different ballasts. Since the publication of the previous article I have received 9 more 150W DE lamps. 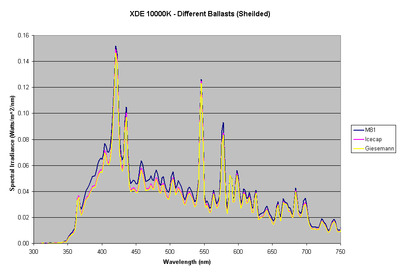 In this article we present the analysis of the lamps shown in Table 1 along with the ballasts used. 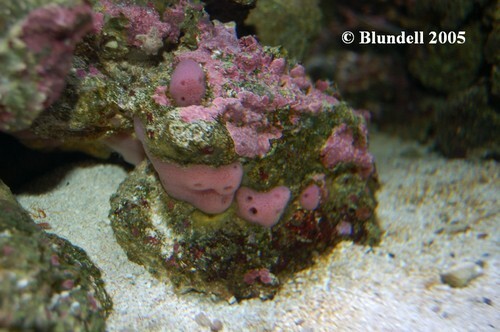 The ballasts tested are a selection of electronic and magnetic ballasts that are commonly available to a reef aquarist. The magnetic ballasts for these tests were a Venture M81 and the electronic ballasts used was the Icecap electronic and Giesemann ballast as used in the NOVA II fixture. 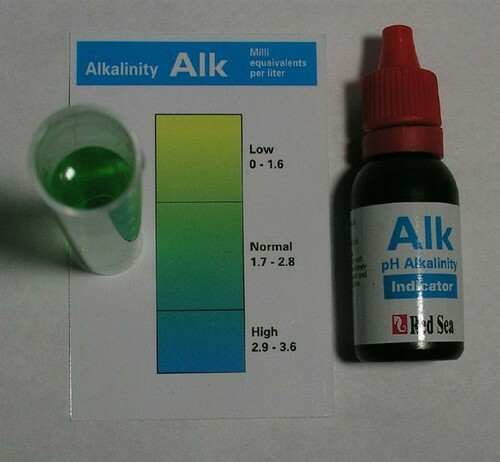 The test setup used is identical to the setup used in . As usual the same equipment was used and the lamp to sensor distance was set at 18″, thus allowing direct comparisons to be made with all our prior results. Spectral data was collected for the bare lamps as well in a shielded situation, since almost all applications recommend using the lamp in a glass shielded fixture. A 1/8″ glass shield taken from the PFO fixture was used. The glass shield was placed on top of the sensor to eliminate any stray unshielded light from reaching the sensor. This would allow us to determine the impact of the glass shield on light output. 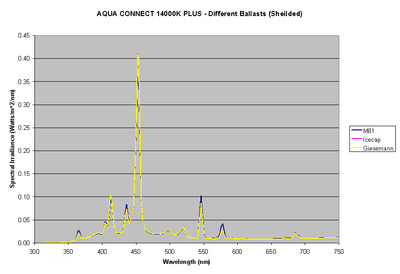 The data collected is presented as follows: The spectral data and light output for each of the lamps is first compared using a single ballast. 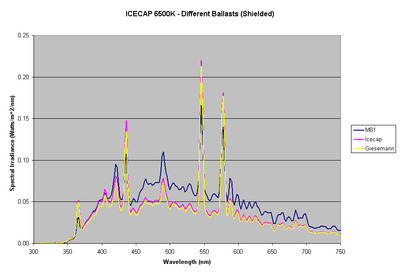 This allows for direct comparison of the spectral differences between the lamps. The next section presents the data for each lamp when used with different ballasts. 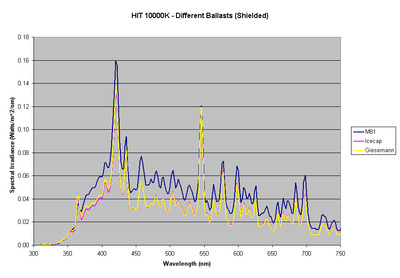 Since the ANSI- M81 is the recommended ballast, we decided to compare the lamps using this ballast to establish a baseline performance. 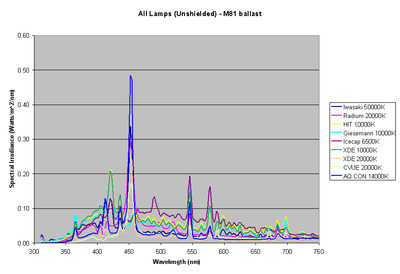 The figure 1 below shows the spectral output of the 8 different lamps when operated by the same ballast (ANSI-M81), with the power consumption, PPFD and CCT shown in Table 2. These lamps are often recommended for use in fixture with UV shielding glass. To determine the impact of the UV shielding glass, the lamps were tested with the shield placed over the sensor. Table 3 shows the impact on PPFD and CCT of using a 1/8″ UV shielding glass removed from a PFO lighting fixture. The use of the shield resulted in a drop in the PPFD ranging from 18%-20.2%, with a larger drop in the UV and blue ranges, consistent with the range observed in our previous studies on other 150W and 250W DE lamps. 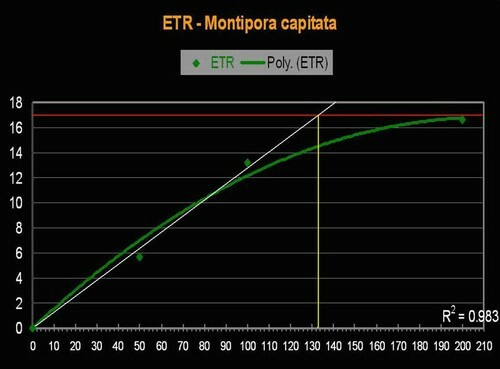 In this section we present the results of testing the different lamps using different ballasts. For each lamp, the 3 ballasts were used to fire the lamps and data is presented for the unshielded and shielded case. Spectral data is only provided for the shielded case, since we feel that most lamps will be used in this manner. 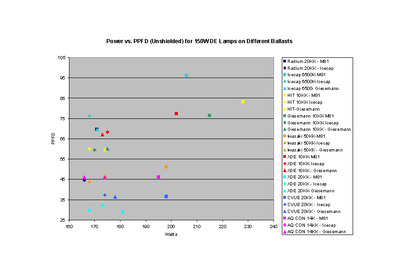 Figures 11 and 12 show graphically the variation in the PPFD of the lamps when used with different ballasts and the variation in PPFD vs. power consumed by the lamp ballast combinations. 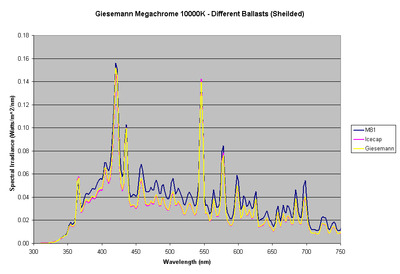 The spectral differences were shown earlier in Figure 1. As seen from these plots, there is very little variation among the electronic ballasts. As usual the higher PPFD values are for lamps with lower CCT. The XDE 20000K and Coralvue 20000K had the lowest PPFD even when compared to similar lamps in its class – Radium and Iwasaki. The higher PPFD values are typically from higher K rated lamps. This data can be used to directly compare the results from out previous studies since they are all taken at the same distance from the lamp. The 150W double ended lamps are very attractive choice for lighting, and in fact we feel they are a better choice when compared to the 175W single ended lamps – based on the fact they produce as much light as the 175W lamps and consume less electricity. Also, the smaller size of the lamps makes it more effective in a reflective fixture. The electronic ballasts for the 150W lamps are also attractive because of the size, weight and heat issues, but they seem to slightly under drive the lamps as compared to the magnetic ballast. There now are a large variety of lamps in this class available to the hobby and hopefully this article along with the previous one on 150W DE lamps will help the reef aquarist make an informed choice. We would like to thank several people whose help made this study possible. They were kind enough to provide us with lamps and ballasts for testing: Patrick at PFO Lighting, Brian at HelloLights.com, Andy at IceCap Inc, Phil from Giesemann and Edward from Aqua Connect. Finally, we would like to thank Dr. Paul Walker of Penn State University for the use of the spectroradiometer and dark room for testing the lamps.